More than 700 homeowners called in on the Channel 6 HOA Hotline on Monday, November 9, 2009. That surely is a clear sign that not all is "honky dory" in the homeowners’ associations, contrary to what the local legislators claim. Far too often we heard from Central Florida state legislators that problems exist only in South Florida . This telephone hotline surely proved otherwise. The phones were busy all the time, often even overloaded. The biggest problem: HOAs raising -- sometimes doubling -- their dues and levy special assessments, killing the budget of many families, already hit hard by the economy. The Live Chat -- from 6:30 p.m. to 8:00 p.m. -- actually crashed the system, which was not prepared to see that many people logging in and asking questions. Not all interested owners were able to enter the chat room. were redirected to the CCFJ website e-mail address, where I found another 64 questions when I returned home. All questions were answered. The telephones were still ringing at 8:10 p.m., when the station manager finally pulled the plug. The organizers from Local Channel 6 had to admit that they had never considered that HOA problems are such a Hot Potato -- the response from the audience was just overwhelming. The recent Sun Sentinel Town Hall Meeting with Live Chat and the Local Channel 6 event "Taking on the HOA" clearly showed that many owners are going to lose their homes if there is no fast solution to the quickly growing association problems. This is seriously affecting as well all the owners who have always been paying their dues. It is high time that our legislators hold banks and mortgage companies liable for all the dues, because banks and mortgage companies are partially to blame for the whole disaster. Too many families are losing their homes because too many legislators would rather grab the campaign funds from the lending industry instead of protecting their constituents who voted them into office! 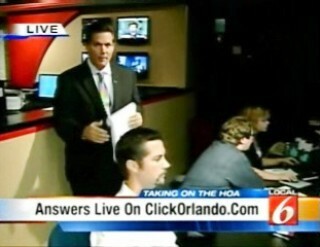 Local 6 and ClickOrlando.com hosted a Web chat with a homeowners association expert on Monday to help homeowners with any questions they had. This is a copy of the transcripts of the chat. clickorlando(A) The mandatory HOA has the power to lien and foreclose on your home for unpaid dues and special assessments. Helen_H(Q) Is it legal for an HOA to place an assessment for the building of a new clubhouse BEFORE they have any of their State and/or city approvals? clickorlando(A) Normally no, it depends on the governing documents. State statutes are silent in the matter. Gaye(Q) We are renting a home thru a realty company. We have been approached by the realty company with a letter from the HOA regarding the care of our lawn. It is going thru a cycle of dead spots here & there. Our next door neighbor is having the same problem & we have noticed other lawns have similar issues. Our next door neighbor said he has received no notice from the HOA & he has had the issue longer than we have. We are being told that we would have to pay fines if the lawn is not "brought up to code". What can we do? We are mowing, weeding, & adding fertilizer. This is just something that happens to lawns periodically & I don't think we should have to pay for sod! clickorlando(A) Selective enforcement is the best defense in any HOA suit. Brown spots in a lawn are very common, especially with the new water restrictions. If the HOA wants to fine you, they have to give you the opportunity to discuss the fine in front of a grievance committee and you can make your side known to the committee. Momentary water regulations in Florida cause brown spots in lawns, and there is little you can do. James(Q) When are you going to tell the homeowners what their obligations are? clickorlando(A) The obligations are set by the governing documents, the rules of the association and Florida statute 720. Ralf(Q) Hello-2 years ago we bought a house, built in 2002, as an For Sale by Owner. As it turns out, a fence, installed as a condition of sale in 2002, has one side encroaching in common area by up to 8 feet. Now the HOA wants it off their land (common property). They have lost all records, and since we are second owners, we cannot prove ARC approval. The fence was constructed pre-turnover. They had threatened 'self-help', and actually just last week tore down the fence and hauled it off. Our fence is one of 25 or more of these encroachments, and we are the only ones they are coming after. The statute of limitation is 5 years from what I heard. Also the HOAr accepted the common land 'as is' on turnover. What can we do? clickorlando(A) This question can't be answered by the Florida statutes. It is a matter of the governing documents and the plat of your community. clickorlando(A) If the bank holds the title after the foreclosure, the bank is liable for all the dues. The bank has to pay HOA dues up to one year prior to foreclosure. niaa(Q) I was told that an HOA can only recover 10% of unpaid fees in a short sale or foreclosure. Is that true? clickorlando(A) No, it is not true. roynsan(Q) we are not in a park, we are in a subdivision of the city of Tavares with a HOA. Can this HOA impose a weight limit on dogs or is this community under the laws of the city? clickorlando(A) HOAs have their own rules and regulations, especially for pet restrictions. They can regulate pet size. NoCH(Q) Doesn't a new clubhouse need unanimous homeowner approval if it was not part of the recorded plat? clickorlando(A) Normally they can't, and no amenities should be added without 100% vote of approval by the homeowners. clickorlando(A) No, they cannot. They have to follow their own rules and regulations when trying to enforce rules. They can only enforce what the Florida Statute 720 allows. Helen_H(Q) Is it legal for an HOA to place an assessment for the building of a new clubhouse BEFORE they receive any of their State and/or local approvals and permits? clickorlando(A) They can't put assessments for something that is not there. catherine(Q) How far can the assoc increase homeowner fees and can we get any of the money back when they forclose or sell the property? clickorlando(A) first of all, they can only increase dues according to gov't documents. and the owner whose home has been foreclosed at auction will not get any funds that may have been equity in the home. HOACAM(Q) What other methods of collection does an association have on securing delinquent fees if not by lien and foreclosure? clickorlando(A) an assoc. can go to court and ask for a money judgment. Tommy(Q) My wife and I live in a gated community that is when the gates are operating, which is almost never. Is there any thing we can do to make our HOA comply to providing working gates. clickorlando(A) DBPR is short for Department of Business and Professional Regulation. it houses the division of condominiums. clickorlando(A) yes, they can. but the HOA can force them to pay by judgment. dstge1212(Q) I just moved into a neighbor hood that has a Property Owners Association INC... they want us to pay 50.00 a year for member ship and 50.00 a year to use the boat dock is this Legal? msfloridagirl78(Q) Hello. I have an HOA that raises our HOA dues every year and after we pay our dues by March of each year. By June they say that we owe other fees (sometimes up to $100.00). I wanted to not be apart of the HOA but they said that I have to as long as I am in this subdivision. Is it fine for them to keep charging us extra fees every year, sometimes twice a year? clickorlando(A) yes, by law, they are allowed to do that. you cannot skip out of an HOA. if you don't like the board decisions, you would have to organize your neighbors to vote out board members. grouperlips(Q) My mother in law is 81 and in poor health my question is when she passes will we still have to keep up the HOA payments or will they let us pay pending the sale of the house? clickorlando(A) you're still liable for the HOA payments. there's no way out. Hammer(Q) what FS says the bank has to pay the fee's for 1 yrs? clickorlando(A) if they have 90 percent agreeing on the matter, this 90 percent should change the board, take it over and change the policy to the way you would like it. SusanS(Q) We have an HOA that has a rule that you cannot put a motor home, travel trailer or RV on a lot unless you have pulled a building permit to buy a house. We have a travel trailer that we have on a lot anyway and we are staying in it, though we have not pulled a permit. The HOA has sent us a Notice to Correct Defect and now they have sent us a notice that the travel trailer will be removed and impounded per the terms of the restrictions. Can they do that? clickorlando(A) if the deed restrictions say so, yes. wildflower(Q) does the Hoa have the legal right to come on your property if told not to, they have some one leave a newsletter hanging from my garage door and I ask them not to they say they have the right to be on my property. clickorlando(A) normally, they do not have the right to trespass. suntree(Q) What can a HOA do when they have a lien on a home that has an upside down mortgage and the home is in the foreclosure process? My HOA has 7 such cases and they are all over a year past due. Is there any way to collect from the lender? Our budget is suffering. clickorlando(A) you can only collect from the lender once the title has changed name. it would be unwise for the assoc. to spend legal fees to speed up foreclosure because the fees would never be recovered. Matt(Q) The commercials advertise "Taking on the HOAs." In my mind Channel 6 should present a fair and unbiased view. Could also PLEASE encourage people to get involved. It will make all HOAs better if people helped. Just think what all of our neighborhoods would look like of there were no HOAs. No one would do any of the work! clickorlando(A) the problems are the fla . laws, which are difficult to enforce from all sides. as long as the fla . legislature refuses to change the laws, we all will have problems. clickorlando(A) that should have been sorted out at the title company when you bought the home. the HOA should have made it clear what amount of dues is still owed. thomasjp(Q) the orginal builder put up a perimeter fence and 4 years ago the hoa replaced the fence and they now say it is my fence what should i do? clickorlando(A) they can't just change the ownership of the fence. the governing documents should clearly state who's responsible for maintaining it. fourcs(Q) I just bought a home in Dukes lake and have not been billed by the hoa should they not cortact me? clickorlando(A) you are still responsible for any kind of dues the HOA charges. your title company should have explained this to you and provided the documents. fmljazz(Q) I have been told that all a resident has to do is pay a part of the HOA fees and the HOA can not do anything about this? Is this true? clickorlando(A) false. as long as you $1 to the HOA, it can go after you for the amount owed. SharonHand(Q) How can you get a homeowner to pay their HOA dues if they refuse to pay because they don't like the managing agent? clickorlando(A) refusing to pay the dues because of dislike of the managing agent is no excuse to not pay the dues. it will not be an excuse at the lien and foreclosure procedure when the HOA enforces payment of unpaid dues. clickorlando(P) all answers from ClickOrlando.com are provided by Jan Bergemann of Cyber Citizens For Justice. jszym4210(Q) Must an HOA provide a copy of its budget to its members? clickorlando(A) if you feel you were cheated, you could file a Fair Housing lawsuit. clickorlando(A) no, you're wrong. if you live in a mandatory HOA regulated by FS 720, the HOA has the power to foreclose on your home for unpaid dues and assesments. Craig(Q) Does a POA come under the same guidelines or laws as a HOA? clickorlando(A) normally, yes. it depends on the articles of incorporation. Board_Member(Q) Would the clubhouse answer also apply for a playground? clickorlando(A) you cannot charge for amenities that do not exist. wildflower(Q) wildflower: can the Hoa come on my property to leave newsletter if told not to? ezgraggen(Q) We fell behind our HOA, due to medical issues. We wanted to catch up, but it was too late, the lawyers that our HOA have contracted will not work with us and now we are making monthly payments almost equal to our yearly HOA dues. If we can barely afford this, but because of the threats of foreclosures, we are now falling behind in other responsibilities. Please help! clickorlando(A) if you agreed to installment payments, then you're liable to make the payments. AshleyO(Q) Homeowners in our HOA don't pay their dues for about two to three years and disregard the letters, then they show up at a meeting asking for all fees, including attorneys be dropped, while we have others who make the effort to contact the Board and make payment arrangements. How do you handle those that refuse to answer or make any payment arrangements. clickorlando(A) any HOA should have clear guidelines how to handle collection of dues. no exceptions should be made. otherwise, you run in danger of being accused of selective enforcement. Hammer(Q) who makes the HOA Board follow the law? clickorlando(A) nobody. there's no regulatory agency in Fla. enforcing the laws. you're only way out is a lawsuit filed in civil court. Board_Member(Q) Where can we read the Florida Statues (ie, web link, etc)? clickorlando(A) go to www.ccfjedu.net -- click on the link for HOA and you will find all the statutes, etc..
ochat(Q) How much say does an HOA have about your lawn. I had cinchbugs and weeds came up so I got some brown patches. I received courtesy letter to fix brown patches. I have hired a pest/lawn service. I then received a stern letter the next month that if the brown patches were not fixed, they would be turning this over to attorney and I would be responsible for all costs. I only have a few patches and some houses in the community have more or have their yard wild. How much control does the HOA have over yards? clickorlando(A) the HOA has controls over the yards if so empowered by the governing documents. your description points to selective enforcement. momentary water regulations increase the danger of brown spots on the lawn. dstge1212(Q) IS Property Owners Association the same as HOA? clickorlando(A) see the answer above in the chat. jezebel(Q) Our HOA's Board is made up of 75 % members from the developer and 25% voted in by the homeowners. The 25% always gets out voted. How can the 25% get things done if this is the case? The homeowners are always at the losing end. clickorlando(A) according to Fla. Statute 720, the developer has to turn over control of the community to the owners. the way it has to be done is described in Fla Statute 720.307. as long as the developer is in control, he has a right to appoint his members to the board. clickorlando(A) because in many places there is no other option to buy a home newer than 10 years that is not mandated by an HOA. clickorlando(A) as long as the bd. of dir. has levied a special assessment, it's valid and can be enforced. any dispute over the special assessment has to be dealt with in the court of law. majestic(Q) our HOA and one of the past board member is being sued by a Homeowner. Can that past board member run for office? Can he be stopped from running fo rthe board just because he is named in a law suit? clickorlando(A) Fla. Statute 720.306 gives no eligibility provisions for board members. any owner can be a candidate for the board of dir. Jodi_of_Arc(Q) What do you do if your Association reps are dishonest about money, and the sherriffs call it civil and the DBPR call it law enforcement's jurisdiction? What remedy is available for the unit owners if they are tossed back and forth between regulatory agencies on such issues? clickorlando(A) in the moment, nothing. a bill will be filed for the next legislative session that will deal w/this issue. it is a very common complaint. WWHA(Q) Can my HOA force me to paint my home if it is decied it is not being maintained and can they demand it and then if not painted paint it and then bill me for the work? clickorlando(A) there are various answers. and even courts have decided in different directions. it all is very much depending on your governing documents and the power given to the HOA to force you to paint your home. AshleyO(Q) We have homeowners that installed pavers, flag poles, fences, etc., without an ARB approval. Now a couple of years later the HOA becomes aware of it and sends them a violation. Is the items now grandfathered in? clickorlando(A) yes and no. it depends if the HOA enforced these rules before. and if they were part of the original deed restrictions that govern the land. roynsan(Q) our HOA claims they have some sort of insurance policy that is the basis of the weight limit. How can they have insurance on privately owned property in a city subdivision? clickorlando(A) if referring to pets, it may be. i would ask you to take a look at a copy of the ins. policy. fourcs(Q) due the hoa have to publish a list of what they spent the HOA funds for? Mary(Q) I am hoping you can help. Our Management team, World of Homes, have taken over and there are several of us at Lake Olympic Townhomes in Ocoee feel like we can not give anymore money. Our proposed budget for 2010 has come up and they are requesting a special assessment, which I can understand. It comes out to 64,000 over a 3 year period. At the same time the Management team has increased their operating costs by 47% from &78,201. to $115,581. In the last meeting we had , they had mentioned that "We are all in this together." I am just not feeling it. Is there a limit on what they can increase their fees? clickorlando(A) there's no limit if not stated in the governing documents. but the mgmt co. should work w/the owners and if the owners feel that the mgmt co. is not working in their interest, they should consider replacing the mgmt company. egavulic(Q) As a Board member and active part of the community, I am almost sure that most of the owners who have complaints, have NEVER served on the Board or volunteered their time to their neighborhoods. The best advice is to be active, attend the meetings and read your documents & guidelines. thomasjp(Q) what type of lawyer would i need to talk to about HOA problems? clickorlando(A) a specialized HOA attorney. Board_Member(Q) My community's bylaws were written in the early 1990's. Many of the clauses contained within are obsolete and/or have been superceded by Florida Statute or Laws. What is the correct process for updating our bylaws so that they are in agreement with State law? Do the modifications need to be voted on by the community even if they're just being changed to be consistent with the law? clickorlando(A) simple bylaws can be change by vote of the board and should be brought in compliance with Fla. Statute 720. NoCH(Q) What can be done of a HOA tries to add amenities without even trying for 100% homeowner approval? clickorlando(A) the only way out would be a lawsuit filed in civil court to prevent the HOA from adding an amenity that is not mantioned in the original documents. trish(Q) i'm a good condo owner, no fees over due, i had my car towed away form our parking spot, as abandoned property. we filled out infomation card (tele# plate #) with property manager when we first bought the place and stated that we were snow birds.car is registered in another state. clickorlando(A) there is no remedy. the answer is in the governing documents. gymfields(Q) can a deed resticted community be changed to a HOA? HOW? clickorlando(A) a deed restricted community is not necessarily an HOA . it has to be in the original deed restrictions. if there is no madatory HOA, only 100 percent of votes of approval by all deeded owners can make a community a mandatory HOA. clickorlando(A) a majority vote cannot dissolve an assoc. clickorlando(A) sue. but try the nice approach first. skydoo(Q) Can individuals in the assoc. board of directors be personally liable for the HOA actions? clickorlando(A) no. board of dir. are indemnified for the actions of the board. Hammer(Q) Barbara does an excellent job with her advise...! Keep up the Good Fight!! This is a great public service that you are providing on Local 6 News!! Thank you!! kim(Q) a small condo assoc of owners had been built when developer went to foreclosyre, a investor bought the remaining and has offered all for rent in this gated community, is this legal? clickorlando(A) yes. if the governing documents did not contain rental restrictions from the beginning. tomseaman(Q) Am I intitled to a refund? I bought a lot in 2003, and got my contractors licensed in 2004 , I just got my certificate of occupancy in July of this year. The Declaration of covenants and restrictions says Assessments against lots owned by contractors, A licensed contractor who owns unimproved lots, uncompleted dwelling units, or completed dwelling units for which a certificated of occupancy has been issued by the county and which have never been occupied, the assessment against such lot shall be twinty-five percent (25%) of the annual assessment. full assessment shall commence the month forrowing initial occupancy. clickorlando(A) According to Flori9da statutes that is not the case. You are not the developer and have to pay dues from the date when you bought the lot, but your deed restrictions could say otherwise and exempt you, but I doubt that. clickorlando(A) No. Condominiums are regulated by Florida statute 718, HOAs are regulated by statute 720. There is a big difference. FLAFLF3(Q) WHAT RIGHTS DO WE HAVE WITH WHAT THEY LAUGHINGLY CALL A HOMEOWNERS ASSOCIATION, DO WE HAVE TO JOIN AND PAT THEIR FEES? clickorlando(A) Yes. If the community has a HOA, you are automatically a mandatory member of that association. rkvereb(Q) Can an HOA impose fees or increase the dues of homeowners that pay on time if others do not pay at all? clickorlando(A) Yes they can, sorry to say. scammedbybigmoney(Q) re: HOACAM - How can an HOA go to court if parts of its membership isn't paying dues? Aren't the lawyers really the only ones making money? 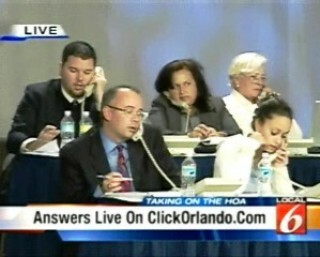 clickorlando(A) Yes the lawyers are the only ones making money. Dick_FLT(Q) can the owner of a lot vote to extend the C&Rs on another lot covered by a separate Declaration? clickorlando(A) No owner can do that. clickorlando(A) A mortgage company is always part of the foreclosure because they hold the first mortgage and that will not be extinguished by any foreclosure by any party. aylene(Q) there's mold present in the building in the Landings...HOA and developer are aware of it...and they wont fix it! clickorlando(A) If mold is not fixed it can be a very costly predicament in the future. The sooner mold problems are fixed, the less expensive it is to fix them. HBHresident(Q) Can a Board continue to use a landscaper who charges our community $10,000 more than bids we have gotten from other landscapers? Oh yeah, this guy is our President's brother-in-law. roynsan(Q) how can this HOA dictate that we cannot put up a fence according to code when other propertys have fences that are so -called grandfathered in? clickorlando(A) that is a matter explained by your governing documents. check them to find out if why the board thinks that they can selectively enforce fence restrictions. snoopy(Q) Can an HOA board pass & enforce a special assessment (in addition to regular dues) that has not been voted on my the homeowners? polly(Q) WHAT ABOUT PROTECTION OF THE PEOPLE WHO PAY ? clickorlando(A) in the Fla. Statutes, there is no protection for owners. the statues were written by service providers who only had their own profit in mind. clickorlando(A) with a 2/3 vote of approval by membership, you can change your deed restrictions the way you want it to read. poa_nightmare(Q) how long should a legal opinion take on validating a majority vote of property owners to dissolve an association - the association has no common areas no legal board of directors no developer the development was turned over to property owners years ago. clickorlando(A) a legal opinion is just that. it does not change the way the vote of the memberhsip has to be conducted. jszym4210(Q) How is turnover from developed to owners initiated? What happens if the developer fails to turnover the HOA at the time defined in the By-Laws? How are funds collected by the developer turned over to the owners when they take responsibility for the Association? scooter5(Q) When the developer turned the assoc. over to the owners, we had a bunch of goofballs who didn't know what they were doing. There was never any repairs made and we are facing huge amounts of $ to repair the defects. How can we recoup these funds. We can't find an atty to take them on??? clickorlando(A) actually, you will never be able to recoup the funds. board of associations are ruled by the business judgement rule, and there's no court in this country that will hold the members of the board who made the financial mistakes liable for the financial losses. Deborah(Q) Any idea if Tallahassee will resurrect the ombudsman position to help HOA's so we can obtain assistance without always incurring exhorbitant legal fees? clickorlando(A) the attempt to create an ombudsman and a regulatory agency has been made many times over the last few years in Tallahassee . all failed because service providers and board members fought regulation. and the owners will nowhere to be seen when these bills came up for discussion in the legislature. aylene(Q) is the HOA responsible to fix the building or the developer who owns most of it? MOLD that is...? clickorlando(A) as long as the developer is in control of the building, the developer is responsible for fixing mold problems. John22(Q) My HOA gives me a hard time to do basic requests for gutter cleaning, and for the past 3 years they have done nothing for the community. No badly needed paint jobs or any other maintenance of the units. What can be done? clickorlando(A) it is up to you to force the assoc. to follow-up on their responsibilities. if gutter cleaning can be enforced by the assoc., you better clean your gutters before they take any further action. HOACAM(Q) Is an CAM employed (not contracted) by an association considered a Public Figure as it would pertain to a slander-defamation suit? clickorlando(A) any person can be sued for libel or slander. thomasjp(Q) our hoa only post the date and time of the monthly meetings is this legal? clickorlando(A) yes. HOA statutes do not require agendas to be posted but it would be advisable. only for budget and special assessment issues is a specific notice required. clickorlando(P) 3 more minutes until the chat ends. clickorlando(A) the chat transcript should be available later this week. aylene(Q) who's responsible when there's mold in a building? clickorlando(A) under normal circumstances, the bd. of assoc. is required to maintain the building. that includes mold problems. roynsan(Q) do HOA rules supersede laws of the city and state? clickorlando(A) yes and no. it very much depends. this cannot be simply answered. clickorlando(A) so far attempts at trying to achieve this have failed in court. they are 2 separate corporations and should stay that way. clickorlando(P) last question of the chat. AshleyO(Q) we found out, after an audit, that we were underfunded in our reserves. The HOA decided, last year, to do an increase of 3% every year to cover the monies instead of doing one assessment. Is this legal? clickorlando(A) yes, it is. but reserve fund increases or decreases are subject to the votes of the memberships. clickorlando(P) Thank you to everyone who participated in the Local 6 chat! clickorlando(P) Thanks again and have a great night!